As Southwest Florida becomes an international destination, the housing market becomes increasingly crowded. Because more desirable addresses tend to have the oldest homes, people have to choose between location or a new and fully equipped home. That’s where companies like Genuine Home Builders come in. They make it possible to have the perfect home in the perfect location. Working with clients from the moment they purchase their new home, Kim Todd and the team at Genuine Home Builders create dream homes from ones that leave a lot to be desired aesthetically. Their ability to combine custom home building experience with a full-service remodeling business gives them a unique perspective as they tackle challenging remodels in homes and condos throughout the area. “Our longevity this field and the market is one of the reasons we are so successful at what we do,” says Todd. 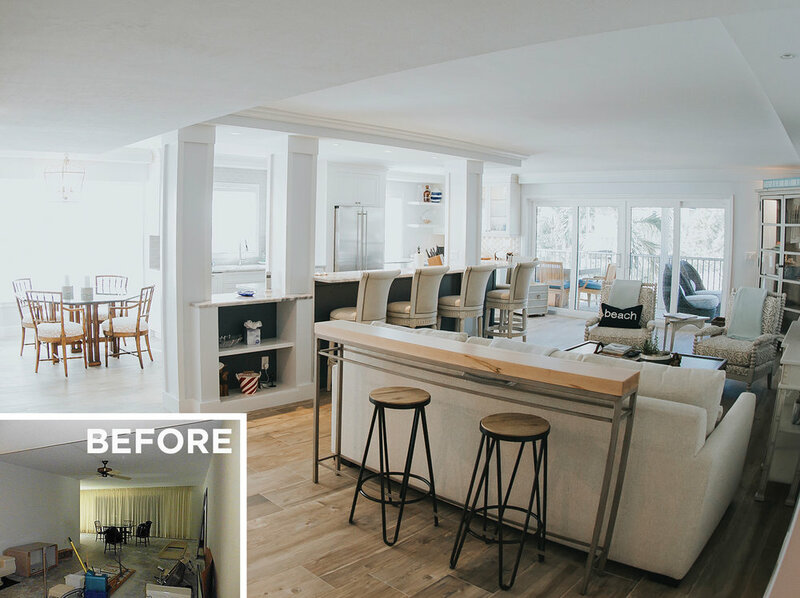 “Not only are we able to anticipate problems that might arise at the beginning of the remodel, we are able to see past ugly interiors of all shapes and sizes and create living spaces that will work for our clients’ Naples lifestyles.” An ugly interior was exactly what they were given when they began work on a recent condo remodel. While the new owners loved the location of the condo, water damage from the water heater left a musty smell, low ceilings made the home feel like a cave, and walls partitioned off the unit, boxing it in and blocking light from the large sliding glass doors. “I knew the home had good bones, and more and more we are meeting with people who’ve bought a home or condo in a location they like and are now trying to find the company who can help them realize their vision for the existing structure. They put a lot of faith in us,” says Todd. After meeting with the new owners and creating a plan based on their budget and vision, work began. Walls were torn down and drop ceiling removed to create an open floor plan. The kitchen represents the most dramatic change in the home. Before, it was a walled off room with poor natural light. The cabinets and “vintage” wallpaper were topped with a low and heavy feeling ceiling that created a less than ideal cooking and entertaining space. Todd and the new owners worked together to develop a floorplan to open up the room to the rest of the house taking down all the walls and raising the ceiling to create an open space with movement and an abundance of counter area. “We had to work the island around two columns that hide chase ways for the whole building,” Todd explains. “We were able to balance those two columns by adding one more at the opposite end which creates a nice separation between the kitchen and the great room and was a perfect place to put a small bookshelf.” Todd also chose to create a smaller drop ceiling over the island so linear AC vents could be put in the middle of the room to better circulate air throughout the main area of the home. She also created a dry bar for more entertaining and storage space and created an open dining room. The badly damaged master bath is unrecognizable as it was the center of the water heater leak. 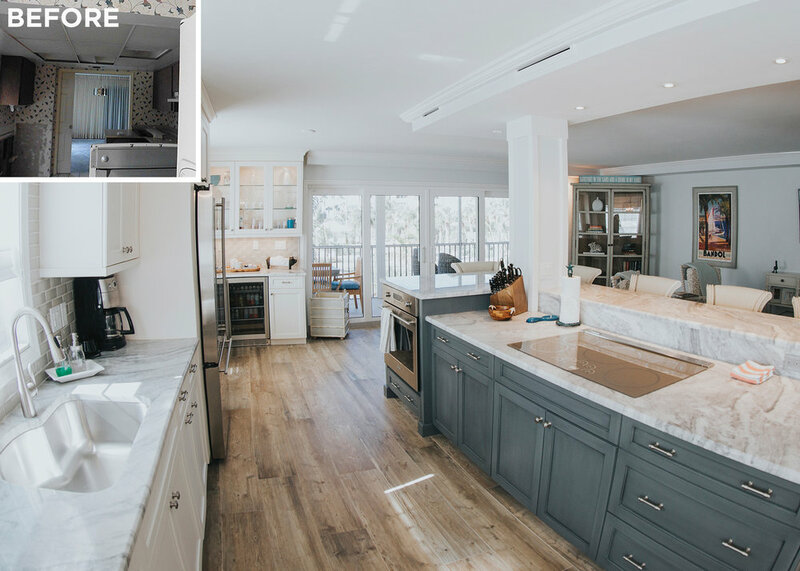 Todd and her team stripped away old cabinets and drywall and replaced them with an open concept master bath with a large countertop and double sinks. With ample storage and a sleek new shower, the master bath is now a true retreat. A family-owned and operated business, Genuine Home Builders, Inc. is run by husband and wife team Kim and Steve Todd who personally supervise all aspects of each job, providing a personal touch and expertise for their clients. With over 70 years of combined experience in construction, they specialize in custom home remodeling and new home construction.